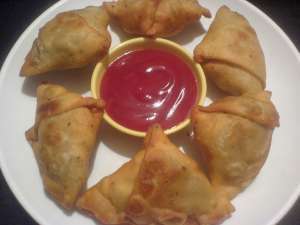 This vegetable samosa recipe is a very popular snack recipe. Samosas are irresistible. They are generally served as snacks and it is a quite a filling snack. Samosa is originally from the North India but now it is a part of everyone's recipe collection. It is popular not only in India but outside India too. It is a favorite snack food served at parties and celebrations. Kids and the teenagers love it. Samosas are something that every one likes to eat at least once in a while. You can make a lot, and serve when you want. Just heat in the oven before serving. You can freeze them. Defrost them and heat before serving. Isn't that convenient? green peas - 1/4 cup cooked. Red chili powder - 1/4 tsp or according to taste. Mix flour, salt, 1tbsp oil. Add water little by little and form a tight dough.Keep aside. Take a lime sized ball of dough. Roll out in a circle of about 6" diameter on a rolling board using a rolling pin. Cut the round into half. Each half will make one samosa. Add a big tablespoonful of the stuffing on one piece. Fold into a triangle, holding the stuffing in carefully. Form all the samosas in the similar way. Heat oil for frying. Keep the heat medium. Add 3 or 4 samosas into the hot oil. How many you add will depend on the size of your pan and the oil in it. Fry on both sides till they are golden brown. Turn once in a while so that they are evenly fried and browned. Serve hot with tomato ketchup or coconut chutney, mint chutney. Tips: You can use only peas or potatoes if you wish. You may also add beans, carrots for variation. Add cashew nut pieces, raisins to make it richer. Fry samosas in batches so that they are evenly cooked. Do not add too many at a time.